The ATS Drug Device Discovery and Development (DDDD) Committee is excited to announce the launch of the 4th Annual BEAR Cage (Building Education to Advance Research) competition at the ATS 2018 International Conference in San Diego. The BEAR Cage competition was developed to promote productive discussion of innovative research proposals in the setting of a fun, yet competitive, forum promoting opportunities for collaboration, mentorship, and growth. 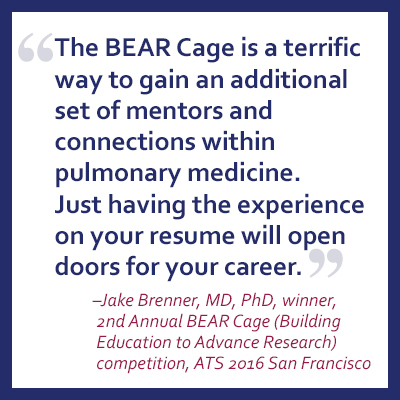 Early career investigators are invited to submit their research proposals to the BEAR Cage competition by Dec.15 for a chance to win $5,000 at the live event at ATS 2018. Learn more and apply today! Assembly on Pulmonary Rehabilitation will discuss whole-body vibration training in patients with COPD at noon ET, Tuesday, Oct. 24. Reserve your seat now. Assembly on Allergy, Immunology, and Inflammation will feature the article, "Tezepelumab in Adults with Uncontrolled Asthma" at 4 p.m. ET, Tuesday, Oct. 24. Reserve your seat now. Assembly on Nursing will present "Enhancing Health Policy and Advocacy Leadership Through Research and Organizational Engagement" at noon ET, Thursday, Nov. 2. Reserve your seat now. Each year, more than 9.6 million new cases of tuberculosis are diagnosed and more than 1.5 million TB-related deaths occur globally. Since its beginnings, the ATS has had a strong role in TB control, with a history dating back to 1905, when it was established as the American Sanatorium Association. Today, we continue this fight. View our TB Advocacy Video. Have at least 40 heads of state attend the meeting. Development of a set of political and numeric targets for 2020 and 2025 linked to the Global Plan to End TB. An action-oriented political declaration with regular reporting to UNGA as an accountability mechanism. Agreement to hold a UN High-Level Review meeting within four years. A commitment to increased financing for TB control programs and research and development. Malignant mesothelioma is a rare type of cancer that occurs in the thin layer of cells lining the body’s internal organs, known as the mesothelium. There are three recognized types of mesothelioma, and pleural mesothelioma is the most common form. Further information regarding diagnosis, causes, and treatment can be found on the Mesothelioma Cancer Alliance’s website. Like the ATS, the alliance also advocates with and for patients with mesothelioma. Heather Von St. James is a mother, wife, survivor of mesothelioma, and patient advocate. See her story.